Home » 2014 » January » 20 » A Place Of Our Own! A Place Of Our Own! It’s been a very long road but we’re very excited to finally have a place of our own, allowing us a lot more flexibility and freedom (not to mention warmth!) 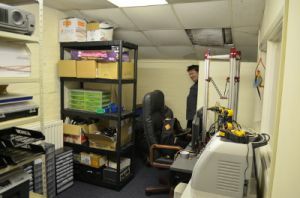 If you’re not familiar with Southampton Makerspace (or even if you are) you may be interested to read on. 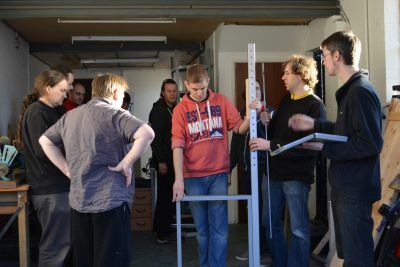 But we like to think of Southampton Makerspace as a friendly and inclusive community of people who like making things (be they physical, digital or otherwise) and sharing knowledge, experience and tools. Currently the interests of the current membership seem to focus on subjects of wood- and metal-work, more arty disciplines such as costume design, and of course technology (3D printing, microcontrollers (Arduino, etc), robotics, home automation, computers (Raspberry Pi, etc) and programming). We have a significant number of tools available to facilitate these activities and our members are often willing to lend their own personal tools too. 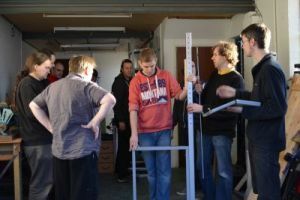 At the beginning of 2013 we attempted to set up a makerspace as a charity, but this was quickly quashed by the Charity Commission who insisted that we were an educational outfit and thus must register with Ofsted to qualify. Not being fans of bereaucracy but not giving in easily we decided to go ahead the next best way – as a non-profit company limited by guarantee (CLG) – So Make It Ltd. Whilst we were sorting out the paperwork to register with Companies House one of our members had located someone who could help us out with somewhere to meet and keep our stuff – Tim from rideride Cycle Workshop was very supportive of our venture. He very generously allowed us to use a 500sqft area in the corner of their warehouse at just the cost of the electricity we used until we were big enough to afford a space of our own. We continued to grow and met much more frequently at the rideride warehouse; until finally at the end of 2013 we realised we were big enough to set out on our own and we crowdfunded some capital and started looking for places to go. The beginnings of some organised storage space! You'll normally find Benjie slaving over a keyboard pumping out code in an attempt to help charities to more easily leverage their volunteers, contributing fixes to open source code, or perhaps adding a new feature to the Members Area. He lives in Southampton with his wife Jem Gillam - a fellow maker - and their two adorable young children. As the original founder of SoutHACKton he is very happy to serve as one of the five So Make It Trustees. can the physical address be used to ship donations? Hi David, we’re not sure yet – testing the postal system to the address is on our todo list; though if it’s larger than the letter box then it’s unlikely anyone will be in during working hours to take delivery (most of us have jobs or education during the day). What are you looking to donate? CircuitCo in conjunction with BeagleBoard.org would like to donate some BeagleBoneBlack boards and accessories to celebrate the opening of the new Makerspace!